All the goodies that make a reel your go-to choice are built into the XiA--at a price you'll find hard to believe. This reel is built for performance, from its super-durable DigiFear drive train to the silky-smooth 11-bearing system including Infinite Anit-Reverse. ABS Metal spool for clean, frictionless operation; Advanced Locomotive Levelwind; Gyro Spin balanced rotor; Tangle Guard; Bail Safe system; TwistBuster II Lifetime Bail Spring; one touch folding handle; and FREE aluminum spare spool. "this is a real good spinning reel. its really smooth and has great line cap and can handle big fish easily." 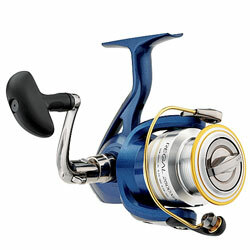 "I matched this reel with a Team Daiwa rod 7" rod, and the largest regal offered. Too much flex in the body of reel when fishing a fish. Gears all ready feel rough, and makes bearing swoosh noises when used with larger line. " "Got a heckuva collection of equipment, including reels, but this is one of my favorites. Use it for just about every application. Have had both shoulders done and needed something to replace baitcasters and this one has succeeded." "I recently purchased the 4000 reel. I have it mated to a 6'6' med action ugly stick. This reel casts a country mile even farther than my bait cast reels. I have used daiwa reels for years and never had a problem."